Have you ever been out walking or jogging and gotten annoyed by sweat dripping down your face or getting in your eyes? Since I've started "running" (I add quotation marks since it's more like jogging slowly since I am just starting out with this whole running business), I've noticed how much sweat drips down from my forehead and onto my face. It's quite annoying and oftentimes I thought about bringing along a towel to wipe off my face with during my jogs. So I was thankful to find out about Bondi Band, which is a company that makes moisture-wicking bands and hats for any type of activity. They not only make these for women, but also for men, children and bandanas for dogs! I picked out a couple of the heavy sweat wicking bands since they are made from dry-tech coolmax material to absorb a lot of sweat. 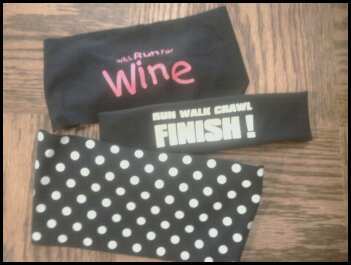 I picked a super cute polka dot one so I could look stylish during any activity, and then one that says "Run Walk Crawl FINISH!" 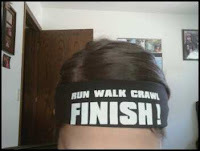 for training for the 5k in September, since that's pretty much my motto right now - I don't care how I get to the finish line as long as I get there! I also picked out one to give away to my friend who runs all the time and is training for her first marathon. 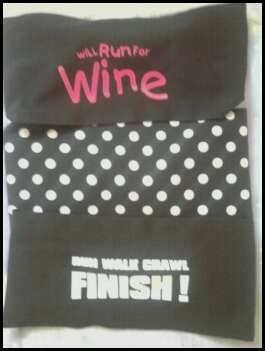 She loves wine - hence, the "Will run for wine" saying. I just had to test out my Bondi Band right away today so I took my dog and went on a jog through the nature park with my Run/Walk/Crawl band. I was very happy to find that it is made from very thin material so it isn't heavy or hot, and it really did soak up the sweat well. 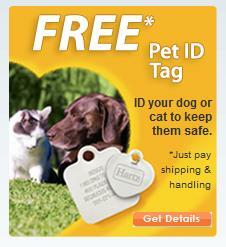 Today was a perfect day to test it too, since it is HOT outside! I was sweating buckets, but no sweat dripped into my eyes or down from my forehead. It really kept my head cool too, and it is nice that you can wear it full size to cover more of your head or fold the edges underneath to make it cover a smaller area. I can see how this would be a perfect band for cooler weather too since you can put it over your ears. When I first put it on, I had it too far down on my forehead so I kind of looked like a biker chick (They do have a biker chick category too). 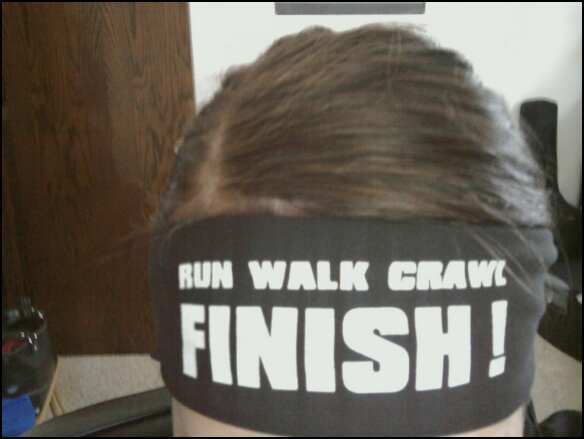 But once I folded it up more and wore it higher, I looked more like a runner. I also really like that these are machine washable since they'll obviously need to be cleaned quite a few times! I really like my Bondi Band, and I recommend these bands for anyone who plays sports or runs or even just for going to the gym. I will probably even wear mine when I mow the lawn or do anything outside. They are only $8, and there are so many fun sayings and colors to choose from. It really makes exercise more fun because you can look cute while you workout! Thanks Bondi Band! Disclaimer: I was given Bondi Bands free of charge for the purpose of this review. All opinions are my own experiences with the product. Individual results may vary. No other compensation was given.